What is 'Your personal files are encrypted by CTB-Locker'? CTB-Locker ransomware virus infiltrates operating systems via infected email messages and fake downloads (for example, rogue video players or fake Flash updates). After successful infiltration, this malicious program encrypts various files (*.doc, *.docx, *.xls, *.ppt, *.psd, *.pdf, *.eps, *.ai, *.cdr, *.jpg, etc.) stored on computers and demands a ransom payment of $300 (in Bitcoins) to decrypt them (encrypted documents receive the .ctbl files extension). Cyber criminals responsible for releasing this rogue program ensure that it executes on all Windows operating system versions (Windows XP, Windows Vista, Windows 7, and Windows 8). CTB-Locker ransomware creates AllFilesAreLocked.bmp DecryptAllFiles.txt and [seven random letters].html files within each folder containing the encrypted files. These files contain instructions detailing how users may decrypt their files, and on use of the Tor browser (an anonymous web browser). Cyber criminals use Tor to hide their identities. PC users should beware that while the infection itself is not complicated to remove, decryption of files (encrypted using RSA 2048 encryption) affected by this malicious program is impossible without paying the ransom. At time of research, there were no tools or solutions capable of decrypting files encrypted by Critroni. Note that the private key required to decrypt the files is stored on the CTB-Locker command-and-control servers, which are managed by cyber criminals. Therefore, the best solution is to remove this ransomware virus and then restore your data from a backup. Ransomware infections such as CTB-Locker (including CryptoWall, CryptoDefense, CryptorBit, and Cryptolocker) present a strong case to maintain regular backups of your stored data. Note that paying the ransom as demanded by this ransomware is equivalent to sending your money to cyber criminals - you will support their malicious business model and there is no guarantee that your files will ever be decrypted. To avoid computer infection with ransomware such as this, express caution when opening email messages, since cyber criminals use various catchy titles to trick PC users into opening infected email attachments (for example, "UPS Exception Notification" or "FedEx Delivery Failure Notification"). Research shows that cyber criminals also use P2P networks and fake downloads containing bundled ransomware infections to proliferate Critroni. Currently, the 'Your personal files are encrypted' ransomware threat is delivered in the English and Russian languages. Therefore, countries speaking these languages are at the top of the target list of cyber criminals proliferating this malware. To eliminate CTB-Locker virus our malware researchers recommend scanning your computer with Spyhunter. Your documents, photos, databases and other important files have been encrypted with strongest encryption and unique key, generated for this computer. Private decryption key is stored on a secret Internet server and nobody can decrypt your files until you pay and obtain the private key. If you see the main locker window, follow the instructions on the locker. Otherwise, it's seems that you or your antivirus deleted the locker program. Now you have the last chance to decrypt your files. 1. Type the address hxxp://torproject.org in your Internet browser. It opens the Tor site. Note that this server is available via Tor Browser only. Retry in 1 hour if site is not reachable. 4. Copy and paste the following public key in the input form on server. Avoid missprints. 5. Follow the instructions on the server. Server accepts payment in Bitcoin (BTC) only. and select exchange in your country and currency. Or open https://localbitcoins.com/ and find person who sells bitcoins near you. Exact payment amount can vary depending of exchange rates. 4. Transaction completion may take several days. Reload this page in 15 minutes. After transaction completes you will be redirected to decryption page. Don't worry if some errors occurs and connection was broken. Wait 15 minutes and press F5. To make sure that decryption is possible you are allowed to decrypt 2 any files for free. File size is limited up to 1 Mbyte. This is a follow-up on your package delivery (tracking number 0p2uYq5RIho). The package contained in the above-mentioned shipment was not accepted at the destination address. Please contact your local UPS office and produce the printed delivery sticker, included in this email attachment. Please note that in case of a failure to contact your local UPS office within 21 days the parcel will be returned to sender. This is automatically generated delivery status email, please do to reply to it. Server accepts payments in Bitcoin (BTC) only. 1. Pay amount of 0.2 BTC (about of 24 USD) to address - Bitcoin wallet address. Decryption will start automatically. Do not: power off computer, run antivirus program, disable Internet connection. Failures during key recovery and file decryption may lead to accidental damage of files. If you have no Bitcoins press ‘Exchange’. Cyber criminals responsible for creating CTB-Locker ransomware use an affiliate scheme to spread their malware. Affiliates who register and distribute CTB-Locker receive 70% of the profits generated by this ransomware. Note: at time of writing, there were no known tools capable of decrypting files encrypted by CTB-Locker without paying the ransom. By following this removal guide, you will be able to remove this ransomware from your computer, however, the affected files will remain encrypted. We will update this article as soon as there is more information available regarding decryption of compromised files. 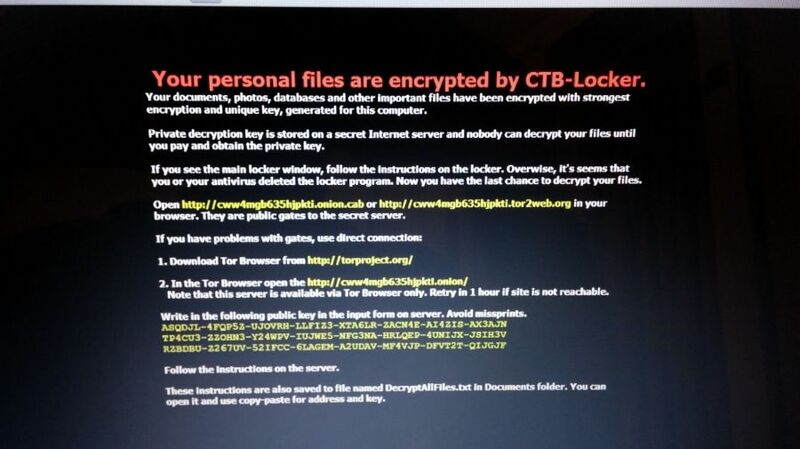 Update February 13, 2016 - CTB-Locker or Cyber criminals using the name of this Windows ransomware have started encrypting websites hosted on Linux servers. The criminals demand a 0.4 BTC ransom to return data to the webmasters of the compromised websites. Previously known ransomware targeting webmasters in this manner was named Linux.Encoder. Your personal files are encrypted by CTB-Locker. Your scripts, documents, photos, databases and other important files have been encrypted with strongest encryption algorithm AES-256 and unique key, generated for this site. Decryption key is stored on a secret Internet server and nobody can decrypt your files until you pay and obtain the decryption key. Fbi's advice on cryptolocker just pay the ransom What to do? 3) A complete list of exchanges! 3. After payment, confirmation is expected within from 15 minutes to 3 hours. You must carry out this actions before: - At the expiry of the time redemption amount will be 0.8 BTC. Please make payment in a timely. Dangerous! Do not try to cheat the system, edit encrypted files, edit CTB-locker internal files or delete any file. This will result in the inability to recover your data, and we can not help you. Only way to keep your files is to follow the instruction. If you have any questions or suggestions, please leave a english message below. To prove that you are an administrator, you must specify the name of the secret file that is in same directory with index.php. We will reply to you within 24 hours. We give you the opportunity to decipher 2 files free! To prove that you are an administrator, you must specify the name of the secret file that is in same directory with index.php. DECRYPT IT FREE You can make sure that the service really works and after payment for the CTB-Locker script you can actually decrypt the files. Do not attempt to replace free decrypted files because they have another encryption key! If you will try to decrypt by this key other files, you will break it. STEP 1. CTB-Locker virus removal using safe mode with networking. STEP 2. CTB-Locker ransomware removal using System Restore. Windows XP and Windows 7 users: Start your computer in Safe Mode. Click Start, click Shut Down, click Restart, click OK. During your computer start process, press the F8 key on your keyboard multiple times until you see the Windows Advanced Option menu, then select Safe Mode with Networking from the list. Log in to the account infected with the CTB-Locker virus. Start your Internet browser and download a legitimate anti-spyware program. Update the anti-spyware software and start a full system scan. Remove all entries detected. 5. Select one of the available Restore Points and click "Next" (this will restore your computer system to an earlier time and date, prior to the CTB-Locker ransomware virus infiltrating your PC). 7. After restoring your computer to a previous date, download and scan your PC with recommended malware removal software to eliminate any remaining Critroni files. To restore individual files encrypted by this ransomware, try using the Windows Previous Versions feature. This method is only effective if the System Restore function was enabled on an infected operating system. Note that some variants of CTB-Locker are known to remove Shadow Volume Copies of the files, so this method may not work on all computers. To restore a file, right-click on it, go into Properties, and select the Previous Versions tab. If the relevant file has a Restore Point, select it and click the "Restore" button. If you cannot start your computer in Safe Mode with Networking (or with Command Prompt), boot your computer using a rescue disk. Some variants of ransomware disable Safe Mode, thus making its removal complicated. For this step, you require access to another computer. To protect your computer from file encrypting ransomware such as this, use reputable antivirus and anti-spyware programs. As an extra protection method, you can use programs called HitmanPro.Alert and Malwarebytes Anti-Ransomware, which artificially implant group policy objects into the registry to block rogue programs such as CTB-Locker. I know this is from a few years ago but I believe that the encryption keys are now available online that can unlock your files? Sorry it has taken so long to get back to you. I hope you got over your loss. Please tell me how I can recover my files. My computer is clean now but I need to recover the files that was affected. Jim Todd, could you give more specifics about the steps followed, what exactly was googled, and so on. Having this very issue today and would love to try to fix it ASAP while waiting for the computer guy to get here. Thanks! Can you call me? I want to understand better what you are saying. If I had un encrypted files why would I need to do this dual upload for decryption???? Thanks for the info, my website was hit by this ransomware - just restored everything from my hosting backup. No need for paying anyone. is there anyone who did decryption for infected CTB-Locker ? I have also been affected by this virus. The servers arew found in what few people know as the "Dark Web" which is run exclusively by the secret sect called the Illuminati (satan for Christians) and should be avoided at all costs. I DID have a backup and I managed to recover all my files. My heart goes out to you Scott as I know how I would feel had that happend to me. I know it is easy to say AFTER the fact but backup is an absolute requirement. I got the virus after receiving a zip file containing the word 'Love' I suspected it to be a virus but was curious. I do use Acronis Recovery so if it did turn out to be something bad I can recover my PC. After clicking on the contents of the Zip file it contained a java script. This then proceeded to encrypt the described files in this report. I have since got rid of the encypted files and everything is ok now. Be careful with the Dark Web, thankfully it is difficult to surf with a normal browser but stay away from it. Check out Youtube for a hacker who tried to hack into it and what happend to him and what he found. Lets just say that it proves that conspiracy theories are actually FACT. Hi Scot, unfortunately at this time there are no tools known to decrypt the files encrypted by this ransomware. There's no use in contacting live support services or taking your computer or SD card with encrypted files to some computer repair shops etc. If the files are not crucial to you could put away your SD card and wait until some tool is developed to decrypt the compromised data. This could happen if authorities captures the cyber criminals are will be able to get access to their servers where the keys needed to decrypt the files are stored. Some people choose to pay the ransom and they regain their files this way, but by doing so you have to remember that you support such rogue business model and you encourage cyber criminals to continue creating such malicious software. I am told by one company that they can decrypt my files for 2,600 usd. Now I need 300 images restored that are encrypted on a memory card with CTB-LOCKER. You mention COMPUTING SPEED & POWER. Is that a factor in cost?? Is it actually possible to restore these files without getting the key from the hackers??? Is it better just to pay the bad guys??? it is certainly CHEAPER!!!! I am a professional photographer. A few weeks ago my computer was attacked by CTB-LOCKER the one with the black screen and code KEY. Proven Data Recovery has been able to identify the VARIENT of the virus I have. It is - RSA-2048 CTB-Locker encryption virus. They want 2,600 for the decryption of 300 image files that this virus has encrypted on a SD CARD. The computer still reads close to 900mb of data on the card and I have been told by multiple sources that there is a chance my images are still there, but I have had no luck and it's going to take me quite some time to come up with this money so in mean time I am exploring other options and learning more about computers and code than I would otherwise have never cared to. It angers me to no end that people can actually even do this. That they can hurt total strangers in this away. Hurt their jobs. Effect their lives just for the sake of doing so and then dangle our data in front of us so we freak out and jump. I refuse to pay this RANSOM and it is frustrating to no end that the supposed GOOD GUYS want WAY THE HELL MORE!! It's very backwards to me and does not seem right. It is almost impossible to get a simple strait answer from people in this area and there is a lot of double talk and I have bad a couple people remote access my computer and I see them try things even I have tried. The files that are blocked were never on my hard drive. I didn't even have time to make a hard copy. One moment they were find and the next they were encrypted. I have done 2 system restored and a factory restore and computer has updated protection but the files remain locked on my card. What are the odds? Is it even worth saving all this money for these people? He did ID the variant. Even that came as a shock. It's all I have to go on. Maybe, if you think you have a solution for me of course I would be willing to work put pay arrangement but I would need to see at lest SOME proof. Maybe do one or two that I can see. There are 300 on the card and I am really quite desperate for this material, or to be told convincingly and enough times that all hop is lost. I am not at that point yet. If you don't have a RP, you'll have to brute-force the decryption and that will need hardware of many thousands of $ in value, so unless you have a few thousand terraflops of processing power at your disposal, you can't do much. I have the CBT-Locker virus - I was not aware - while gone I left a backup running to a removable hard drive. Was gone for more than 96 hours, Malware found and quarantined the virus too late - all files on hard disk and backup disk are CBT-Locker encrypted. How do I proceed, even if I have to pay? I have the same issue ; any one can help please ; I tried to use pandaunransom tool ; it seems dosen't work fine . Hi, want to thank u first for your efforts ! a have just a question : if i don't have a restore point ? how can i do to get my data back ? A QR code (Quick Response Code) is a machine-readable code which stores URLs and other information. This code can be read using a camera on a smartphone or a tablet. Scan this QR code to have an easy access removal guide of CTB-Locker virus on your mobile device.